Steampunk art, fashion and culture has far outgrown its roots in retro science fiction, blossoming into an altered image of the distant past, filtered through a dream future world that might have been. Though firmly anchored in a gilded age when technology offered unlimited hope and promise, steampunk has transcended the limits of time and space by melding the modern with the moldering, brass with class, one might say. 1999’s Wild Wild West was a film that did much to popularize Steampunk as a legitimate artform and one of the movie’s most iconic images was that of evil Professor Loveless’ gigantic steam-powered spider. 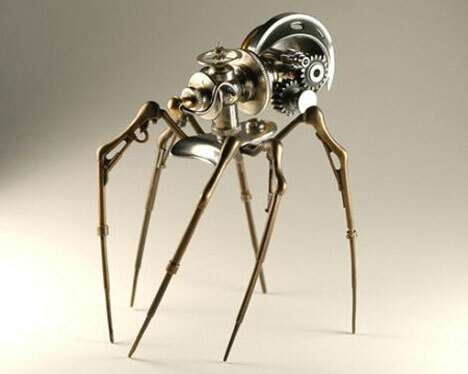 Now renowned Steampunk artist Chris Conte has managed to get a leg – actually 8 legs – up on the competition with this supremely creepy Steam-Powered Arachnid. Professor Loveless would love it! 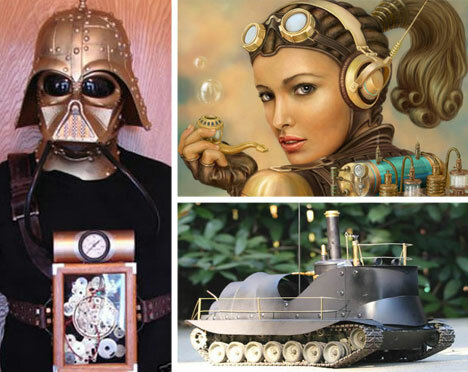 Star Wars remains one of the most popular inspirations for Steampunk art, perhaps owing to the timeless Good vs. Evil theme of George Lucas’ serial space odyssey. 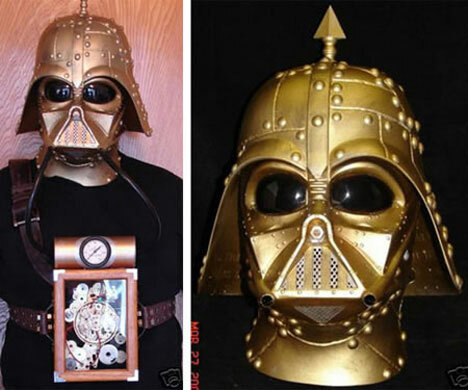 Take this Steampunk Darth Vader Mask for instance, reworking Lord Vader in classic brass seems, if anything, to add an even more malevolent luster to sci-fi’s most vilified villain. The hunnish Great War helmet spike is the crowning touch. 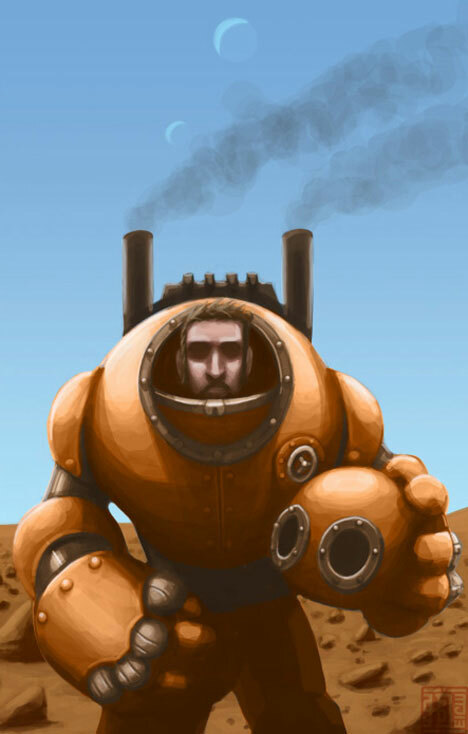 Just the concept of a Steampunk Spacesuit presents a plethora of logistical problems (steam in space?) but it’s nice to dream, and the proto-steampunkers of the 19th century were great dreamers. Then again, there’s nothing like steam heat to warm the cockles of a spaceman’s soul as he/she traverses the cold depths of interplanetary space. The coppery costume depicted above, brought to you by the dreamers at Steampunk Costume Resources, looks perfectly at home amidst the rusty sands of the Red Planet. Doctor Who was Steampunk even before there WAS a Steampunk, thanks to clanking Brit-props like the devilish Daleks. 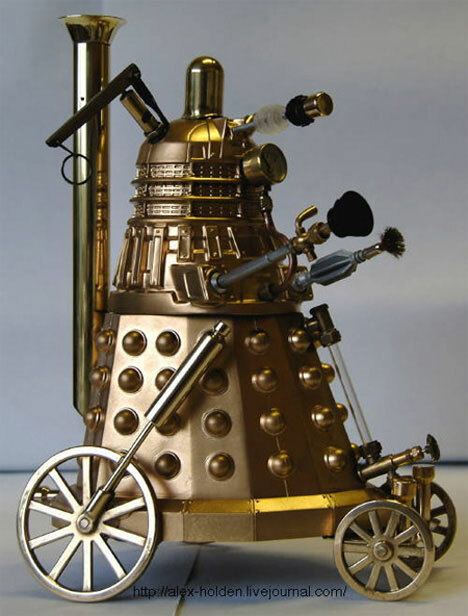 Sporting jumbo rivets aplenty and retaining their trademark “exterminate!” attitude, Mr Holden’s model of a Steampunk Dalek was built especially for the Great Crystal Cyberdrome Exhibition of 2008. We are not amused… though suitably impressed. What better way to escape from a pack of furious Daleks then by using your Steampunk Jetpack? 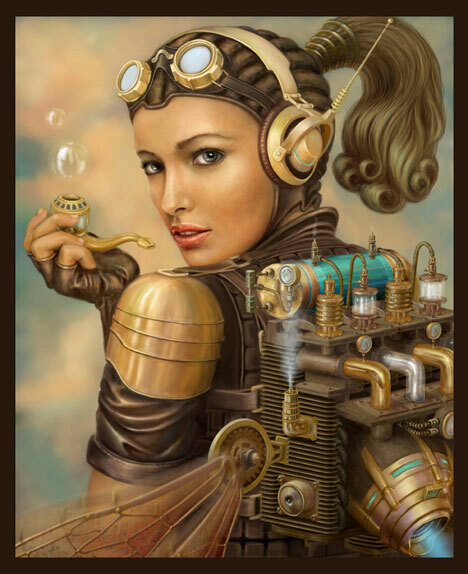 This one, albeit existing only as a photoshop image posted at the Gnomon Workshop Forums, nevertheless embodies the true spirit of Steampunk while adding a welcome shot of sexiness. Put that in your brass bubble-pipe and smoke it! Sticking with the Steampunk shoot-em-up theme just a little longer, we have the Steampunk Raygun – don’t leave Arcturus 4 without it. 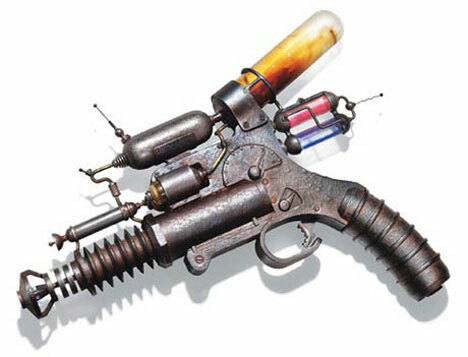 Unlike many Steampunk creations, the “Goliathon 83 Infinity Beam Projector” is a production item that actually can be bought. Made by Weta (the talented folks behind those gnarly LOTR props), this gritty-looking, antique rust finished pistol weighs a hefty 10 pounds and costs a cool $700. That’s a lotta bang for the Buck, Rogers. Now that Steampunk case mods and keyboards have made the rounds, retrophile designers are moving on to computer peripherals to complete the online timeline experience. 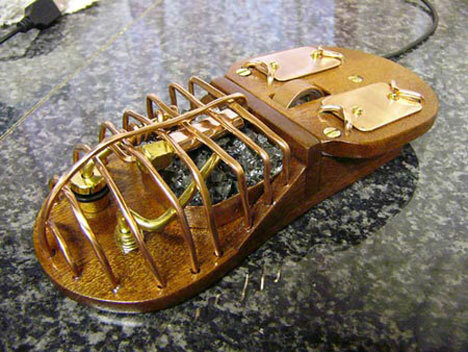 Unklian has taken on the task of creating the ultimate Steampunk Furnace Mouse, shown above in all its wood, copper and orange “hot coals” LED glory. It looks like a cyborg trilobite; just the thing you want to caress while scrolling through the next chapter of “Victorians on Venus”. The USB flash drive is another popular peripheral. These compact, convenient memory sticks have taken on so many forms that even a site named Everything USB is having a hard time keeping up. 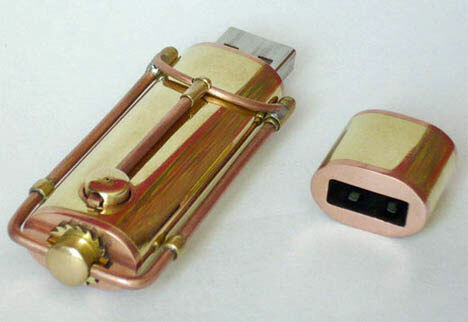 Into the fray now comes the Steampunk USB Drive. This lovingly hand-crafted digital data storage device was made in Russia, though not in the time of the Czars. Reminiscent of either Moriarty’s snuff box or a samovar for super-intelligent naked mole rats, the main drawback of this Steampunk masterpiece is that it’s the only one of its kind. 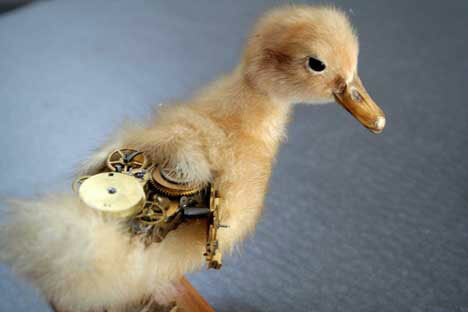 Steampunk objects are often objets d’art… that is, they don’t have to actually DO anything, just look the part. Such is the case with the Steampunk Eye. 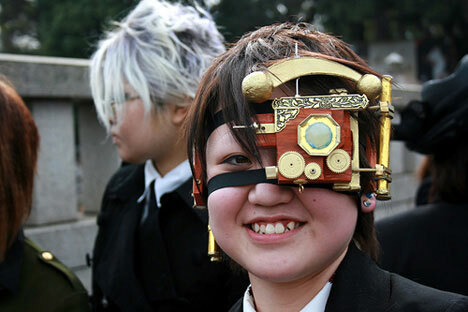 A one-off creation snapped by an alert photog named Nullsleep during a cosplay convention in Tokyo, the Steampunk Eye exhibits the finely wrought detailing and hand-forged presence that characterize the best instances of Steampunk art. 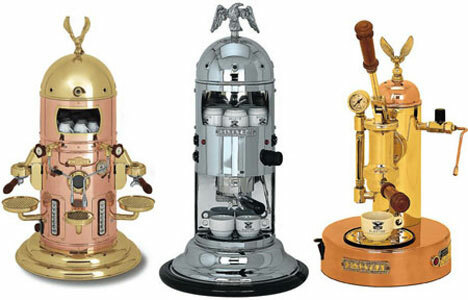 High-end coffee machines have always sported a heaping spoonful of Steampunk style, posibly due to being built around miniature steam boilers. Planet Damage showcases this gleaming trio of Steampunk Coffee Machines from Elektra that have got everything a java-juiced steampunker needs polished stainless steel, copper & brass cases, organic curves and ornate details like Eagle finials that resemble the reverses of Civil War era American coins. Timewarp through a wormhole to some bizarro Western Front and you just might find the Steampunk Lobster Tank. 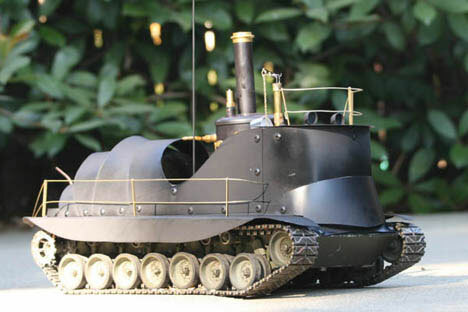 A real, steam-powered working model created with significant effort by the mind behind Crabfu, the formidable mini-panzer is based on a Tamiya 1/16 model tank kit. Modifications included swapping out the electric motor for a working Regner steam engine powered by a volatile butane/propane mix that provides about 20 minutes of motility. You can just imagine the Steampunk Lobster Tank leading megalomaniacal Count Thermidor’s final assault on Newburg. Steampunks and Pirates… seems like a complementary combination! No well-dressed, er, SteamPirate would be caught walking the plank without a Steampunk Pirate Bandanna from Ratchet’s Shop. 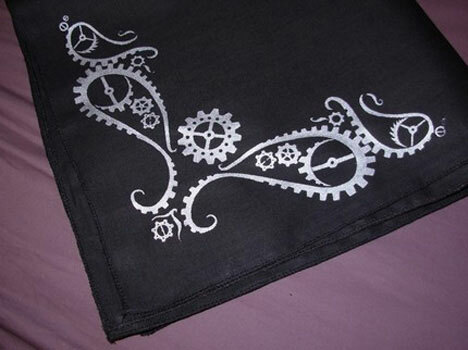 At just $7.50 a pop, the bandannas feature a unique paisley gear pattern… can we call them Disraeli Gears? – in a variety of color combinations. Ratchet accepts online orders payable via the usual methods, possibly pieces of eight. Formal occasions call for more dignified couture but Steampunk fans can still add some retro energy to their ensemble with Steampunk Silver Cufflinks by Velvet Mechanism. Jewelry & accessories retailer Velvet Garden has hopped on the Steampunk bandwagon by blending vintage components and precious metals. 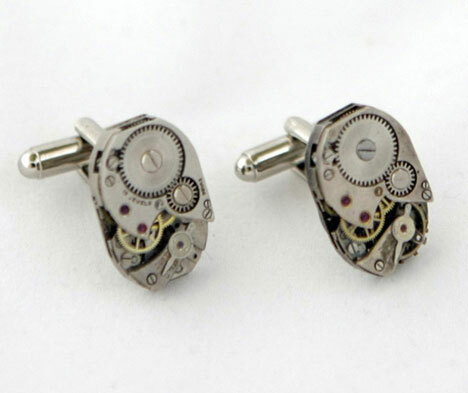 These cufflinks and a matching unisex lapel pin are crafted from sterling silver and incorporate authentic watch parts that turn & tick like miniature machines. Lisa Black may be the world’s only practitioner of Steampunk Taxidemy, an exclusive field if there ever was. Black’s disturbingly disconcerting images meld the organic with the mechanic. Her Baby Crocodile even has working gears, making it a croc that no longer takes a licking yet most definitely keeps on ticking. The story goes that over a century ago, the great-grandfather of artist Paul St George built an undersea tunnel which spanned the mighty Atlantic from London to New York. Forgotten by time (but not by the younger St George), the legendary tunnel was recently spruced up and refurbished in time to celebrate the 125th anniversary of the Brooklyn Bridge. 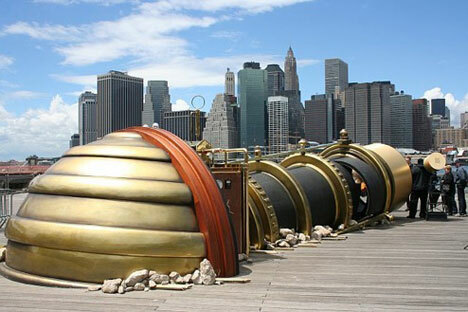 Installed at either terminus of the tunnel are hulking Steampunk Telectroscopes that allow viewers in New York and London to keep a monocled eye on their opposite numbers.